Then click the Change User Name or Password link on the left-hand menu to update your login information. Then you can make any changes you wish to your User Name and/or Password by deleting and entering a new username or entering and confirming a new password. What is the User Name criteria? A Username must contain at least one letter and only contain letters, numbers, underscore, or dash. We do not allow multiple usernames, so if a username is already in use, try adding numbers or characters to make yours unique. We recommend using a strong password that contains letters, numbers and symbols. 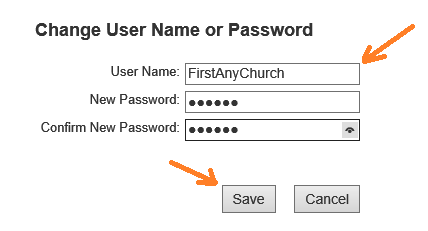 Passwords should not be shared with the church congregation or with any other church or organization.